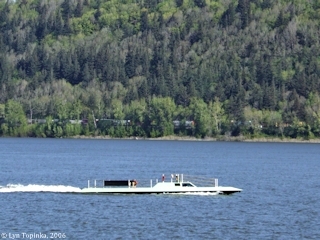 "Columbia River 'Stealth Boats' and other 'Odd Boats'"
Click image to enlarge "Stealth boat" on the Columbia River, as seen from Rooster Rock State Park, Oregon. Image taken April 24, 2006. All information found online was from sources I've never heard of and can not verify as to authenticity, however all sites seem to say the same thing. I've included two such informational posts and their sources here. Although the boats are somewhat publicised by their manufacturer, they are not well reported and have been subject to several "mystery stealth boat" articles on the web. ..."
Source: "covertshores.blogspot.com" website, June 21, 2010, "Alligator & Sealion stealthy semi-submersibles. "For about a decade there have been sightings of some very peculiar high-speed watercraft patrolling up and down the Columbia River between Portland and Vancouver. It just so happens that these phantom vessels are some of the US Navy SEALs newest toys. Although I have had some trouble getting a confirmation on it, it seems that Oregon Iron Works, a locally well known metal fabrication firm, has been involved with building the Alligator since its inception and continues as the prime contractor for constructing not only the Alligator Class but also its follow-on Sealion and Sealion II Class. " 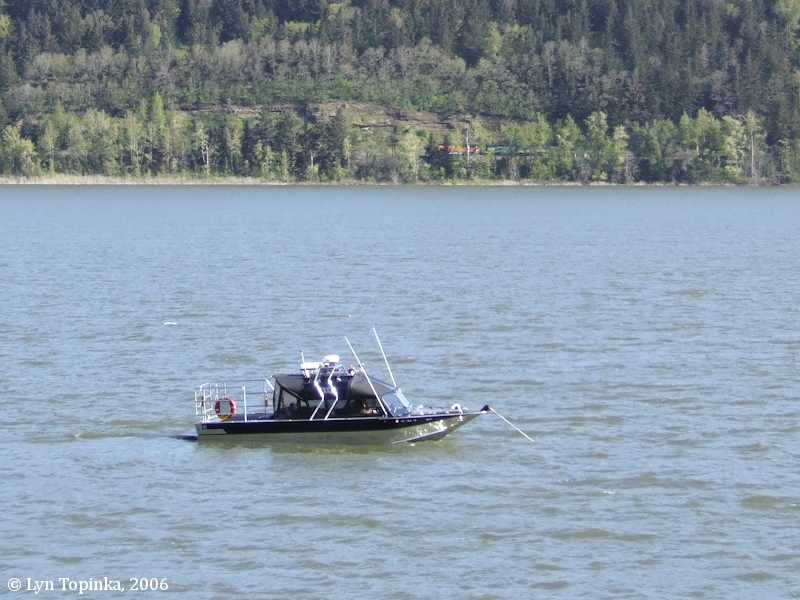 Source: "foxtrotalpha.jalopnik.com" website, May 29, 2014, "Unmasking The Columbia River's Mysterious Stealth Boats", written by Tyler Rogoway. This black boat was anchored just off of Rooster Rock State Park and appeared to be associated with the "Stealth Boat". The "Stealth Boat" was approaching from downstream and passed this boat. 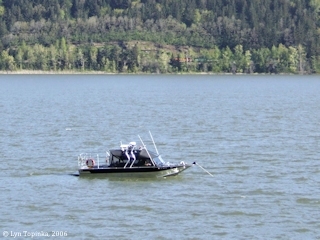 Click image to enlarge Possible "Chase Boat" associated with the "Stealth boat", as seen from Rooster Rock State Park. Image taken April 24, 2006. Not sure if this is the latest "stealth boat" or just a home-made design. 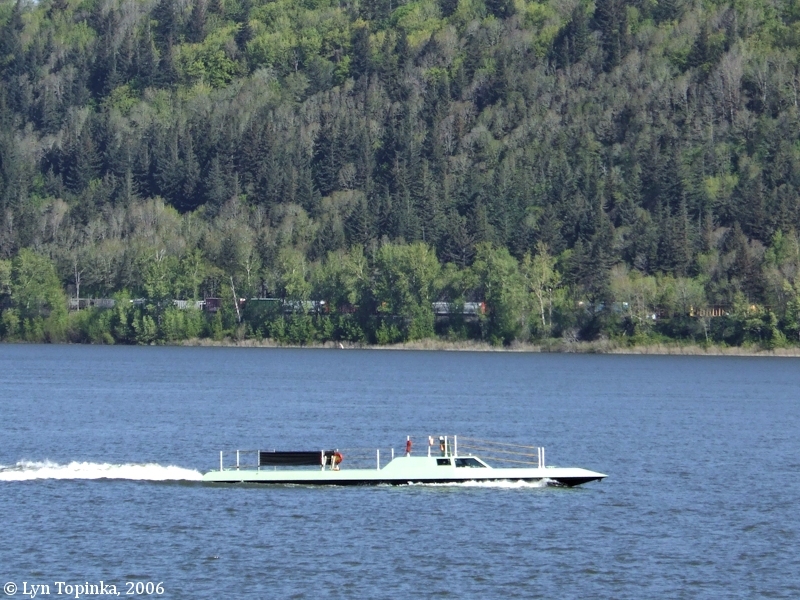 Click image to enlarge "Odd boat" on the Columbia River, as seen from Hamilton Island, Washington. Image taken February 25, 2017. "covertshores.blogspot.com" website, June 21, 2010, "Alligator & Sealion stealthy semi-submersibles.